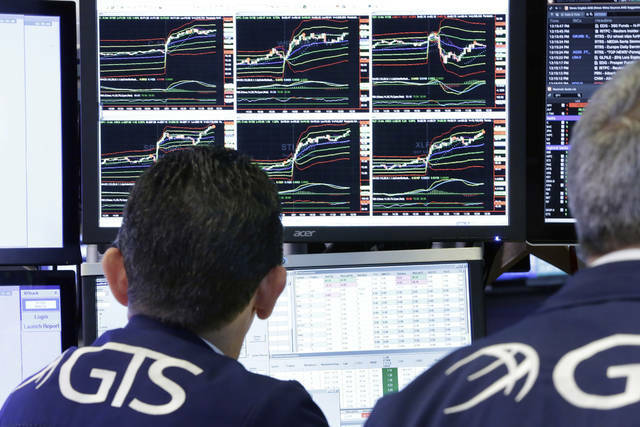 NEW YORK (AP) — Once again, Wall Street’s jitters over the escalating trade dispute between the U.S. and China proved to be short-lived. U.S. stocks closed solidly higher Tuesday as investors largely brushed off the Trump administration’s decision to impose tariffs on an additional $200 billion of Chinese goods. A swift response by China, saying it will increase tariffs on $60 billion worth of U.S. goods, also didn’t dampen investors’ buying mood. Gains in technology stocks and consumer-focused companies powered Tuesday’s broad rally, which reversed nearly all of the indexes’ losses from a day earlier. The S&P 500 index rose 15.51 points, or 0.5 percent, to 2,904.31. The Dow Jones Industrial Average climbed 184.84 points, or 0.7 percent, to 26,246.96. The Nasdaq composite gained 60.32 points, or 0.8 percent, to 7,956.11. The Russell 2000 index of smaller companies added 7.42 points, or 0.4 percent, to 1,710.97. The Trump administration announced late Monday that it will impose tariffs on an additional $200 billion of Chinese goods starting next Monday, potentially raising prices on goods ranging from handbags to bicycle tires. The tariffs will start at 10 percent and then climb to 25 percent on Jan. 1. Even so, there were no signs of the jitters Tuesday that caused Monday’s sell-off, snapping a five-day winning streak for the S&P 500. “Some companies will be affected, but there was an expectation that this could have been far worse,” said Doug Cote, chief market strategist for Voya Investment Management. Technology stocks accounted for much of the market’s gains. Chipmaker Micron Technology climbed 4 percent to $45.33. Apple, which received an exemption to the new tariffs on goods imported from China, added 0.2 percent to $218.24. Fitbit also benefited from some of components that the company uses to manufacture its fitness monitoring bands not being among the items subject to the new tariffs. The stock jumped 6.4 percent to $5.80. Gains by consumer-focused companies also helped lift the market. Netflix rose 4.9 percent to $367.65. Investors also had their eye on the latest batch of corporate earnings reports. Cereal maker General Mills and package delivery giant FedEx declined sharply after reporting quarterly results that fell short of Wall Street’s forecasts. General Mills slumped 7.6 percent to $44.13, while FedEx dropped 5.5 percent to $241.58. Tesla slid 3.4 percent to $284.96 after Bloomberg reported that the electric car maker is being investigated by the Justice Department over public statements made by CEO Elon Musk. Early last month Musk tweeted that he had secured funding to take the company private. A couple of weeks later, he put out a statement saying the go-private deal was off. Oil prices climbed ahead of an upcoming OPEC meeting where members will weigh how to address the loss of supply from Iran, which faces U.S. sanctions. Benchmark U.S. crude rose 1.4 percent to settle at $69.85 a barrel in New York. Brent crude, used to price international oils, gained 1.3 percent to close at $79.03 a barrel in London. The pickup in oil prices helped send energy stocks higher. Marathon Oil climbed 3 percent to $21.50. Bond prices fell. The yield on the 10-year Treasury rose to 3.05 percent from 3 percent late Monday. That’s the highest level since May 22, when the yield hit 3.06 percent. The dollar rose to 112.35 yen from 111.18 yen on Monday. The euro weakened to $1.1667 from $1.1686. Gold slipped 0.2 percent to $1,202.90 an ounce. Silver lost 0.3 percent to $14.19 an ounce. Copper surged 3 percent to $2.73 a pound. In other energy trading, heating oil climbed 1.3 percent to $2.24 a gallon, wholesale gasoline picked up 1.4 percent to $2 a gallon and natural gas jumped 4.2 percent to $2.93 per 1,000 cubic feet. Major stock indexes in Europe closed mostly higher Tuesday. The DAX in Germany rose 0.5 percent, while France’s CAC 40 added 0.3 percent. Britain’s FTSE 100 was flat. Japan’s Nikkei 225 jumped 1.4 percent, while the Kospi in South Korea added 0.3 percent. Hong Kong’s Hang Seng index gained 0.6 percent.